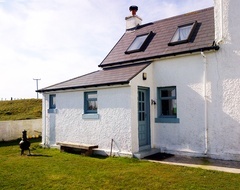 Stunning Bed and Breakfast accommodation overlooking the best beach on the island with superb views across to Rhum, Eigg and Skye. Easy access to amazing beach. Lounge, shower room and separate WC, upstairs bedroom with super-king size bed which can split into two singles if required. TO VISIT OUR OWN WEBSITE FOR MORE DETAILS click here. Living Room - cosy room with wood burning stove, bookcase (with maps, books, games and DVDs), TV, DVD player and ipod dock. Breakfast is served in this room. Shower Room - with electric shower. Separate toilet and wash hand basin. Double Bedroom - with incredible views across the beach, the bedroom has a super-king size bed, which can be split into 2 single beds if requested, down duvet and pillows and Egyptian cotton bed linen. Radio and ipod dock. Ample hanging and storage space. Tea and coffee making facilities. WiFi. Freeview TV. Drying area. Use of fridge and freezer. From Ferry terminal - At the end of the pier road at T-Junction, turn right and continue on that road for approx 4.5 miles through Balephetrish and past Cornaig school on right. 200 metres after the car park at Barrapol Loch (windsurfing school) turn right over cattle grid and up the track signposted Private Road. Continue straight on this track for 600 metres (past barns and farmhouse on left) drop down towards sea. Beach House is the large white house on the left at the end of the track. 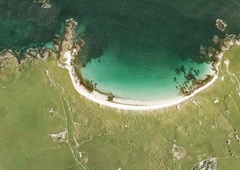 From airport – Out of airport, past The Rural Centre, at T Junction, turn right and continue for 2 miles until junction at Balephetrish. Turn left, continue for 1.5 miles, past Cornaig school. 200 metres after car park at Barrapol Loch (windsurfing school) turn right over cattle grid and up the track signposted Private Road. Continue straight on this track for 600 metres (past barns and first farmhouse) drop down towards sea. Beach House is the large white house on the left at the end of the track. We can arrange to collect and return you to the ferry or airport. Off road parking. Easy access to breath-taking beach immediately in front of accommodation. Where possible our breakfast products are sourced, grown or made locally. 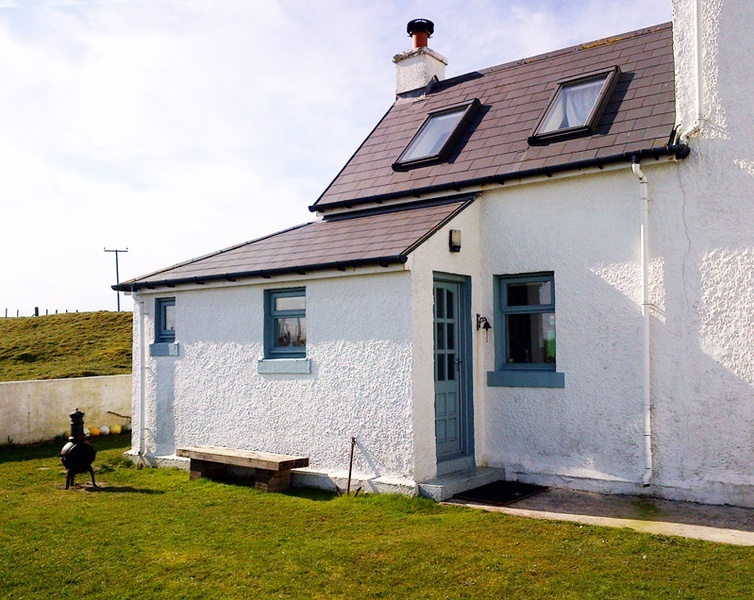 The menu includes home made bread, jam, marmalade, black pudding, local eggs and honey from Jo’s bees at Balephuil. We believe in real milk, not UHT cartons, proper coffee and quality tea. Homemade baking and a wee dram will help you to relax at the end of the day. 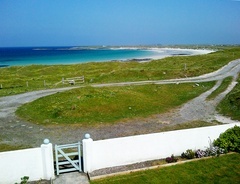 £90 per night twin/double or £75 per night for single occupancy. 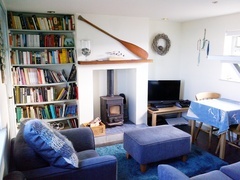 £95 per night twin/double or £75 per night for single occupancy. For latest information and news see our Facebook Page - click here. Full payment is required on booking. We ask for payment in advance as there is no passing trade on Tiree to cover “no-show” vacancies. We advise you to consider taking out travel insurance to cover the cost of your accommodation in the event that you have to cancel or the ferry or plane is unable to reach Tiree on your arrival or departure days. There are a number of on-line insurance providers, which may be able to provide cover and may be suitable for your specific purposes. If you have to cancel before travelling and we are able to fill those dates, we are happy to refund your payment.